and a 1-year subscription ($16.58 per month). and a 2-year subscription ($12.46 per month). Trend Micro Home Network Security protects against cyber-attacks for all your smart devices. Provides protection against cyber-attacks for every smart device in your home. Simply plug the box into your wireless router, download the app, and you’re protected. You can control the usage and security of all the smart devices in your home via the Android and iOS mobile app. Allows you to set time limits on game consoles and block social apps during homework and family time. 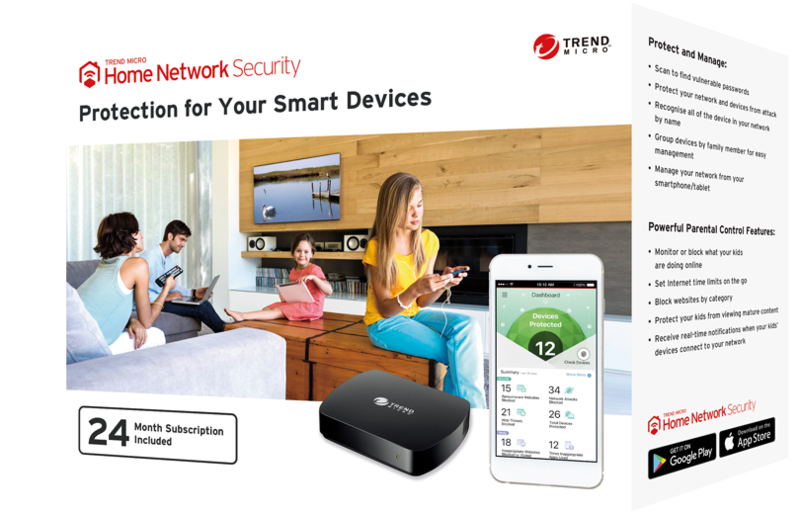 Trend Micro Home Network Security provides protection against cyber-attacks for every smart device in your home - including game consoles, smart TVs, and appliances. Any product that is connected to the Internet now has the potential to be hacked; leading to data and identity theft, financial loss, and privacy invasion. Setup Internet time limits by user profiles in real time. We are on our way to a “buttonless” world. The day will come when your TV remotes or light switches at home will be redundant. Without any prompts from the user, these devices should be able to perform their functions all by themselves. For the uninitiated, automation is the only criteria needed for devices to be categorised as “smart”, however, there is more to that when it comes to technology and the Internet of Things (IoT). To be considered a part of the Internet of Things, a smart device must be able to perform beyond its original functions. It must be capable of receiving, processing, and transmitting information like a personal computer would. For this to be possible, the device must be connected to the Internet and must be able to interact with other smart devices in its vicinity. Trend Micro Home Network Security is a service that provides protection against network intrusions, web threats and identity theft for every device that you connect to the internet in your home. The powerful Home Network Security Station connects to your router to scan network traffic for threats. The smartphone app keeps you aware of any security issues as well as providing timely and insightful notification about what is happening in your home network – in real time. Smart parental controls allow you to manage screen time for your family, as well as filter any unwanted content from the web and apps. You can edit and apply settings from the app, wherever you are. Home Network Security filters incoming and outgoing traffic with advanced deep packet inspection to provide an extra layer of protection for the home network and smart devices like game consoles, smart TVs and smart home gadgets. In order to scan network traffic, HNS is configured by default to use the ARP protocol. HNS can also be configured to become the DHCP server in the network. What is the difference between Trend Micro Home Network Security and Trend Micro Maximum Security? *Not all models of routers, IP cameras, and NASes may be supported. Will Home Network Security slow down my internet connection speed? In most cases, no. Results may vary by network environment. Does Home Network Security comes with a subscription? Yes, Home Network Security comes with a 24-month subscription. The Home Network Security Station and service will be disabled until the subscription is renewed. This won’t affect your router operating normally. Do I need an additional internet security product to protect my devices? PCs and Macs, smartphones and tablets still require internet security software to be installed for full protection against file-based or system threats. How do I set up Home Network Security? You simply need to connect the Home Network Security station to your router, and pair the station with your Android or iOS smartphone or tablet. A step-by-step tutorial can be found in the Quick Start Guide included in the Home Network Security package. An online tutorial is also available here . You can search for your router here or refer to the list of compatible routers. Do I need to change my home router? Home Network Security will work without requiring any changes to home network equipment. A small number of routers may require configuration in order to work with Home Network Security. You can search for your router here or refer to the list of compatible routers. Does Home Network Security update automatically? Yes, security and firmware updates are automatically sent to the Station to ensure that you always have the latest security in your home network. Automatic updates can be activated for the smartphone app. How do I connect the Home Network Security App to the Station? How do I install the Home Network Security App on my smartphone, tablet? We use Australian Post eParcel for our deliveries, and we usually ship from New South Wales 5-7 business days after receiving the order. © Copyright © 2016 Trend Micro Incorporated. All rights reserved.